Positive economic data helps drive equities higher. 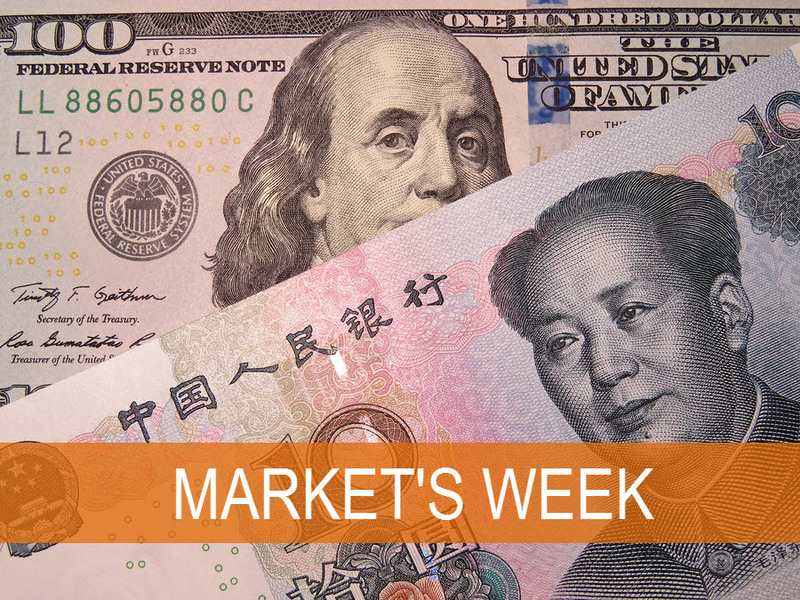 Global equities climbed 2.1% higher, driven by incrementally positive trade news between the U.S. and China, as well as positive surprises in economic data1. Emerging market equities (2.5%) led the charge higher and were followed by the U.S. (2.1%) and non-U.S. developed markets (2.0%)2. Double-digit returns in each major equity region are contributing to strong 14.7% year-to-date global equity performance3. Reviewing the fixed income markets, the 2-year and 10-year Treasury yields moved up 8 and 9 basis points, respectively, leaving the yield curve about as flat as the week prior4. Solid week for growth data as U.S.-China trade talks continue. The U.S. and China trade negotiations continued last week with some positive news, though the handling of intellectual property and enforcement of trade policy continue to be the main sticking points in the negotiations. In a gesture of goodwill (and also extensive need), China has increased its purchases of U.S. farm products. Economic data from both countries also moved higher as manufacturing Purchasing Managers’ Index (PMI) levels rose above prior levels. The Composite PMI in China also experienced a sizable increase over February’s reading. Despite some improvement in the U.S. and China along with potential for a trade deal down the road, global growth concerns have not fully disappeared as growth data in Europe has yet to show signs of a firm rebound5. U.S. jobs rebound after dismal February reading. Last Friday’s U.S. labor market report revealed a significant improvement in March after a poor February showing of 33k jobs added. March saw 196k jobs added, soothing investor concerns and bringing the 3-month trailing average to about 180k jobs added. The unemployment rate (3.8%) remained unchanged while wage inflation (3.2% year-over-year) dipped below surveys and the prior month’s reading. The strong labor market will help the Federal Reserve remain patient as it continues to absorb data to evaluate the state of the economy. Prime Minister May seeks another Brexit extension. With the April 12 Brexit deadline quickly approaching, UK Prime Minister Theresa May asked the European Union (EU) for another Brexit extension as she is now working with the opposition Labour Party to reach agreement on Brexit. May is looking for a three-month delay, but hopes that a Brexit deal would be reached before the European Parliament elections on May 23. European Council President Donald Tusk suggested a flexible extension into April 2020 that would end early if the UK could reach an agreement before that date instead of more frequent short-term delays. Another Brexit extension would have to be agreed upon by all 27 EU member states at the EU summit this Wednesday6. Big banks kick off first quarter 2019 earnings season. JP Morgan (JPM) and Wells Fargo (WFC) out of the financials sector will begin the first quarter earnings season this Friday. In the fourth quarter of 2018, the S&P 500 experienced earnings growth of 12.5% y/y surpassing expectations by 3.9%. Revenue growth also topped expectations at 6.0% y/y. A number of S&P 500 companies issuing negative guidance for the first quarter and headwinds in the technology and energy sectors lead to an estimated decline in earnings of 3.9% y/y. If earnings are near consensus expectations, it would mark the first year-over-year decline since the second quarter of 20167. Headline inflation may experience upward moves. The increase in energy prices is likely a contributing factor to the expected rise in headline inflation levels as oil prices have increased more than 30% year-to-date. Economist surveys show substantial increases in headline Consumer Price Index (CPI) figures with the U.S. moving up to 1.8% y/y and China’s headline figure moving up to 2.3% y/y. However, investors will likely look through the energy impacts as core inflation is expected to remain unchanged from the prior level in the U.S.
Chinese trade data expected to improve. The Lunar New Year holiday may have contributed to large declines in imports and exports last February. Investors will be looking for signs of improvement in March trade data that surveys are showing in addition to momentum in other metrics due to China’s recent fiscal stimulus efforts8. 1) Bloomberg, MSCI ACWI (All Country World Index) returns 01Apr2019 – 05Apr2019. 2) Bloomberg, MSCI Emerging Market Equities Index returns 01Apr2019 – 05Apr2019. MSCI U.S. Equities IMI Index returns 01Apr2019 – 05Apr2019. Bloomberg, MSCI World ex-U.S. IMI Index returns 01Apr2019 – 05Apr2019. .
3) Bloomberg, MSCI ACWI (All Country World Index) returns 02Jan2019 – 05Apr2019. 4) Bloomberg, 2-Year nominal U.S. Treasury rates using data available as of 01Apr2019 – 05Apr2019. Bloomberg, 10-Year nominal U.S. Treasury rates using data available as of 01Apr2019 – 05Apr2019. 5) Mason, Jeff. Lawder, David. Trump says U.S.-China trade deal may be reached in four weeks. Retrieved on 04Apr2019 from https://www.reuters.com/article/us-usa-trade-china/trump-says-u-s-china-trade-deal-could-be-announced-in-about-four-weeks-idUSKCN1RG1OX. 6) Kirby, Jen. Prime Minister Theresa May changes course on Brexit. Retrieved on 02Apr2019 from https://www.vox.com/world/2019/4/2/18292430/brexit-news-theresa-may-labour-deal-jeremy-corbyn. 7) Thomson Reuters. S&P 500 Earnings Dashboard. Retrieved 05Apr2019 from http://financial.thomsonreuters.com. 8) Huang, Eustance. Weizhen, Tan. Stocks in Asia jump following better than expected Chinese economic data. Retrieved on 01Apr2019 from https://www.cnbc.com/2019/04/01/asia-markets-china-pmi-us-china-trade-currencies-in-focus.html.